In a pasture system, grazing animals account for only about 25% of the living animal tissue in the system. The rest is accounted for by bugs that live in the soil and litter (decomposing plant material that lies on the soil surface). The top 10cm of most soils is particularly rich and contains most of the soil’s nutrients, plant roots and living organisms (bacteria, fungi, protozoa, nematodes, earthworms and other soil animals). Soil organic matter and the activity of bugs and earthworms that feed on it help improve soil structure and water holding capacity, allowing rainfall to penetrate the soil and be available for plants. As a general rule, a one percentage point increase in soil organic matter increases soil water holding capacity by 12mm. Groundcover (litter and plants), as well as being a forage source, minimises raindrop impact and loss of water by runoff, reducing soil erosion and nutrient loss. Litter on the soil surface can reduce evaporation by up to 1mm per day. High groundcover levels can also be important in weed control, particularly for thistles and Paterson’s curse, and for reducing the impact of root feeding grubs such as cockchafers and scarabs. One mm of topsoil lost by erosion equals about 10 tonnes of soil per hectare. This soil can take thousands of years to be replaced through the weathering of parent material. Where topsoil has been lost through erosion, the only way to restore some of the productive capacity is by building up organic matter from plant and animal residues. Nutrients are also removed in animal products (meat and wool). In a sustainable system, nutrients removed in animal products need to be replaced to maintain the productivity of the system. All of the biological ‘action’ in the soil relies on providing food together with suitable temperature and moisture conditions. By far the most critical management action which sheep producers can take to protect their soils and ‘keep the soil bugs happy’ is to maintain high levels of groundcover. This is provided by litter, as well as growing and dead plants. The standard benchmark is 70% groundcover (see figures 6.1 and 6.2, and tool 6.2). A minimum of 70% groundcover is the accepted benchmark for the high rainfall zone except for sloping country where close to 100% is needed. For the lower-rainfall wheat–sheep zone, where annual pastures dominate, equivalent benchmark values have not been established, but they may be lower than those for higher rainfall areas. Ground cover protects soil, encourages microbial activity and increases water holding capacity in soils. Soil organic matter levels are influenced by management, climate and soil type, making it almost impossible to set target levels, but for soil health, more is always better. Generally, woodland maintains higher organic matter than pastures and pastures are higher than land cultivated for crops. Procedure 8.2 in Turn Pasture into Product has tips for maintaining ground cover with grazing. Figure 6.1: In the medium to high rainfall zones of eastern Australian, maintaining 70% groundcover can minimise both run-off and soil loss (Lang, RD (1998). Pasture management for both production and stability. Australian Society of Agronomy). Figure 6.2: There is a strong relationship between available dry matter and groundcover (Lang, RD (1998). Pasture management for both production and stability. Australian Society of Agronomy). Fertile soils: increasing soil fertility generally increases both pasture growth and quality, which leads to more and better quality litter and, therefore, more of the ‘good soil bugs’ with increased activity. 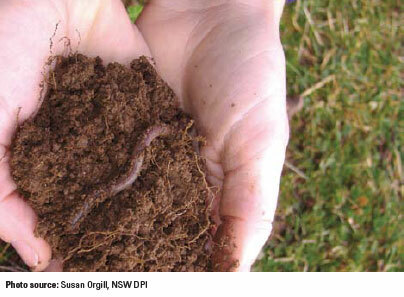 Earthworms are a good indicator that soil conditions are suitable for microorganisms. Sample moist soil at the end of winter / early spring. In the high rainfall zone, more than 10 earthworms per spadeful (20cm by 20cm by 10cm deep) indicates an active biological system — that is a stocking rate of more than 2.5 million earthworms per hectare. An earthy smell is also a good indicator as this suggests active and healthy actinomycetes (beneficial soil bacteria). Some chemicals: herbicides generally have less impact on soil organisms than insecticides, which, in turn, are less harmful than fungicides and nematicides. Most microbes tolerate herbicides with few persistent effects. However, simazine, 2,4-D, paraquat, diquat and MCPA can be more harmful than glyphosate and sulphonyl ureas. Anti-parasitic drenches can have an adverse effect on organisms that first colonise affected dung, but over the entire year the overall effect should be small. Soil Biological Fertility: a Key to Sustainable Land Use in Agriculture (2003). L.K. Abbott and D.V. Murphy (Springer). The Biology of Soil: a Community and Ecosystem Approach (2005). R.D. Bardgett (Oxford University Press: New York). Soil Biology in Pasture Systems – Knowledge and Opportunity Audit: a summary of research into the types and function of soil organisms and their interactions in the soil food web under pasture systems. Download a copy here (1MB).